Will Charlie Crist Run as an Independent? Will Florida Gov. Charlie Crist ditch his state's Republican Party and run for the Senate as an independent? Rumors along these lines have been circulating for months, despite the best efforts of Crist's campaign to snuff them out. Speculation has stemmed from the meteoric rise of rival Marco Rubio, who has become the frontrunner in the GOP primary. Crist himself hasn't definitively ruled out the switch. And recent developments seem to indicate that the governor may be throwing in the towel on seeking the Republican nomination. On Thursday, Crist vetoed a Republican-backed education bill that would have linked teacher pay and tenure to student test scores and make it easier to fire teachers from Florida schools. The legislation was hailed by conservatives, so Crist's veto appears to be a decisive step away from Republican Party. It also seems to curry favor with Florida's statewide teachers union, a traditional Democratic constituency. Prior to Crist's decision, Palm Beach County GOP chairman Sid Dinerstein had singled out the bill as a key signal of the governor's intentions. "If he vetoes it, he's got no support for him in the Republican Party, and he knows it," Dinerstein told Politico. 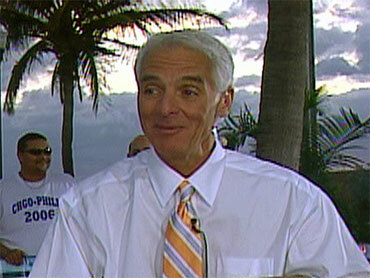 Yesterday, Crist's campaign chairman and political mentor, former Senator Connie Mack, resigned his post. According to the Associated Press, Mack did so to protest the governor's veto of the teacher tenure legislation. Mack, an extremely popular figure in Florida politics, called Crist's veto "unsupportable and wrong." "I can no longer serve as chair of your campaign for the United States Senate," Mack wrote in his letter of resignation. Not too long ago, Crist was considered a shoe-in to become Florida's next senator. But now he finds himself lagging in the GOP primary polls and surrendering the spotlight to popular start-up Rubio. Rubio, the former State House speaker, has been broadly supported by the Tea Party movement as the true conservative in a fierce Republican nominating contest. The Associated Press learned today that Mitt Romney plans to join Rudy Giuliani and Mike Huckabee in endorsing Rubio for senator. Despite his sinking popularity among Republicans, a Quinnipiac poll released Thursday suggests that Governor Crist is still the overall front-runner in the Senate race. If the general election were held now, 32 percent of voters would favor Crist, compared with 30 percent for Rubio and 24 percent for Democratic candidate Rep. Kendrick Meek, according to the survey.